The ease of spitting out something inflammatory or defamatory shows how vulnerable companies are in this day and age, especially when we're giving employees access to our corporate messaging in the form of Facebook, Twitter etc. This is the danger of what happens when "familiarity breeds contempt". This doesn't mean abstain....it just means that companies need social media corporate guidelines now...more than ever before. Story being referenced here is with Vodafone in the UK. Click here for more information. Mitch and I discuss the business of thought leadership in a B2B/service oriented, social media-enabled world. What's real. What is not. Is it too late to stake your claim? What about giving away IP for free? A terrific interview with destination CRM/CRM magazine on "Flip the Funnel"
Poolside chat with David Armano (@armano), where we discuss thought leadership and the difference between "thinking" and "doing"
It's becoming a regular for me....my third appearance on Small Business Advocate with host, Jim Blasingame. We discuss community, leveling the playing fields and more. Marketing over Coffee podcast conversation with host, John Wall. We discuss "Flip the Funnel"
His name is Theodor Seuss Geisel AKA Dr Seuss and according to his prophetic text, "One Fish. Two Fish. Red Fish. 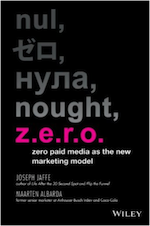 Blue Fish," he outlined the full continuum and future of "media" i.e. paid, earned, owned and NON-MEDIA. They say there are truly no new ideas. That may be said, but it still doesn't mean we can't give credit where credit is due. “It’s like a giant iPhone, except without the Phone,” is probably not that an inaccurate description of the much hyped and it must be said, initially fairly criticized device. That of course was before it came out. About 300,000 people (in this economy) ignored any speculation and purchased the giant iPhone-without-the-phone within the first few days of its retail existence. And now 1,000,000 “early adopters” have followed suit. Truthfully, you have to hold the device in your hand to appreciate what it is. If you’re Jeff Bezos, you’re probably not the happiest camper. If you’re anyone else in the space you should be significantly less happy than Jeff (at least he has a bookstore to support his device – not like iTunes or the App store). Think about it for a moment: how was it that until now, there wasn’t a single large-enough, full color, multimedia portable (read: lightweight) device on the market? Not one. That’s what the iPad brings to the table in terms of have-to-haves. On the nice-to-have front, touchscreen and wi-fi make it even more compelling from a user experience. I’m not boosting this at all (even if it seems that way). I’m just calling it for what it is. A pretty cool all-in-one e-reader, “portable DVD player”, gaming console, digital photo frame and jukebox. And in the case of the latter three, it’s not exactly best in class in terms of practicality, usage and capability. Which leaves us in essence with a pretty nifty portable alternative to TV and as I’ll get to shortly, even magazines. Like the iPod Touch and iPhone, the iPad community will step up to provide context, content and most significantly, the platform upon which to grow the equity and value exchange associated with the investment. It’s Crowdsourcing Apple style. The iPad is way overpriced. An entry level $399 for literally the “bottom of the range” version make this a nice-to-have versus a have-to-have. Although it’s not a NetBook (nor does it profess to be), a consumer with $399 to spend would most likely be best suited to invest in a laptop or NetBook versus the bright and shiny iPad. I also think there’s going to be a tremendous dissonance associated with the first-mover-advantage premium paid to get in early on the iPad rush. Apple has already demonstrated a little too much eagerness when it comes to subsequent releases. Many (the wise ones) will hold back and wait for the next generation iPad which irons on various bugs, kinks and gremlins. There’s an “iPad Tax” which seems to be synonymous with good old fashioned greed amongst developers. iPad applications are currently being developed for the iPad “in HD”, which is just a codeword for, “let’s charge significantly more for the same application because the screen is bigger.” Consumer backlash will probably help to equalize or normalize this egregious premium. Another ridiculous premium is the additional/incremental fee for 3G usage. I’d like to ask why Apple and its 3G carrier partners don’t create an “all in” or “all-in-one” fee for iPad customers who are also iPhone customers. Unfortunately, I know the answer as to why there aren’t price breaks or built in tethering to support the synchronization of bundled devices. To counter this greed, many will “jailbreak” their iPads in order to tether them to their iPhone or similar 3G devices. Screens are going to break. The bigger they come, the harder the fall. The iPad will not save the magazine industry. Don’t get me wrong – there is nothing until this point that has allowed as rich a digital magazine consumption experience as the iPad will allow. Not even close. A company called Zinio tried to create a similar experience on PC’s, but do people really want to read magazines on computers? Is that what they’ve been waiting for all this time? Is that the reason why magazines have been going out of business? Personally I think magazine’s killer app has always been the ability to be read on a toilet and I’m hoping the iPad doesn’t resonate here, but on a more serious note the magazine and newspaper industry are going to lead the hype bandwagon with respect to the iPad. No doubt the ability to add in video, multimedia and other interactive components to the magazine experience will leapfrog the magazine business into the digital (and even social) era, but isn’t that what they once called websites? In addition, the real debate here will be an economic one; a numbers one – the million dollar question will be to what degree customers will PAY for their magazines on their iPad (and secondarily, what this fee – or heaven forbid, premium – will be) versus getting them for free in exchange for…advertising. In the case of the former, will people turn the pages any slower to avoid the advertising they were already avoiding or will the advertising become smarter, more engaging, more targeted and more valuable? That’s another million dollar question, but is it in fact irrelevant? 1,000,000 iPads doesn’t mean 1,000,000 subscriptions to the New Yawn Times or Vanity Fail. And even if every single iPad reader did pony up for a suite of magazine subscriptions, there are way too many to go round and way too few eyeballs to meet them. In other words, a short term band aid solution to massive continuing hemorrhaging circulation drops. For what it’s worth, the battleground for the beleaguered print industry will be an economic one. Ala carte pricing or micropayments for extremely targeted articles, news and information may take the magazine and newspaper business in the same direction the music business is heading and the Cable sector will soon be heading. …and if all else fails, there’s always giving away the content for FREE (gasp). Finally, don’t be surprised if we begin to see a pricing normalization or equalization to “give back” to loyalists and early adopters, and recognize the investment into the iBundle. I wouldn’t bet the farm on the iPad just yet. The reach just isn’t there. Put differently, if you haven’t invested in an iPhone App right now, that’s the place to start. That said, it’s not the worst idea in the world to begin planning ahead for a time when enough of the people who matter to you are taking advantage of rich, immersive and mobile multimedia experiences on screens larger than the Palm of your hand. Think like a publisher. Apple has created a well-oiled vertically integrated machine that will allow you to be a true storyteller (finally!) and who knows, maybe even sell more stuff in the process. Why try and make the most of your “print advertising” i.e. enhance your flailing magazine and newspaper adspend, when you can serve up the entire experience? Content is King. Who knew? The return of podcasting: what was once a subscription-based “video podcast” living on the outskirts of Fringeville is now front and center. The team over at “Will it Blend” are going to spend less time destroying iPads and more time delivering their compelling video through them! The Creative Renaissance that began with the iPhone App store is going to get a whole lot bigger (but not necessarily better). New rules. New context. New usage scenarios may tweak the formula, but the end product is going to be even more consumer empowerment and utility. Brand have a lot to contribute and gain here. Bonus: This wouldn’t be complete without a “Flip the Funnel” reference that goes beyond brand promises to actual customer delivery, service and experience. The stakes and potential are even higher here when companies can reward and recognize their existing customer base and subsets of loyalists, influencers, advocates and ambassadors. As for me, I can’t help but laugh a little at the self-proclaimed early adopters lugging around their oversized iPhones. Silly little geeks. And I say that endearingly. You don’t need to try so hard to be cool. So, I’ll be waiting for the second generation iPad, which should tell you something. Fortunately, it will probably be announced by the time you read this Point of View. This is the inevitable (as in: good inevitable) post to let you know that "Powered is hiring." It's been just under 4 months since we announced the acquisition and as things come together, we're looking to make some key hires across a variety of seniority/experience/tenure levels amongst several departmental skillsets. First and foremost, we're looking for "account" or "client service" or "relationship" people. Think more Scott Monty, with less handkerchief (j/k). In Account Management land, a great account person will make an account and a bad one will break an account. We're looking for the former please. So if you're looking to become a part of the Powered family, drop us an e-mail : careers [at] powered [dot] com. Personally, I love the idea of working "with my own kind". When everyone lives, eats and breathes the same vision, it's so much more productive and motivating to focus on moving forward, as opposed to inventing excuses why not to. People love to buy, but they hate being sold to. The ultimate paradox is our biggest challenge and biggest opportunity. It applies to consumers and it applies to the B2B space as well. People either want to buy or they don't. And when they don't, perhaps we should stop selling and focus on building the relationship. However when they want to buy, we're no longer selling to them, but rather helping them get closer to making that purchase. Ty Montague and Rosemarie Ryan are leaving JWT in search of their next adventure. The real question here is whether in fact advertising and communication agencies and their established executives have a future. Is it possible to teach and old dog new tricks?